Cake decorating is an expensive hobby to practice because it involves several ingredients and special decorating tools. Decorating flawless cakes is possible only when you practice as much as possible, so it is necessary to keep in touch while keeping costs low. Use a coupler with decorating tips and a piping bag so that you can change tips easily without wasting frosting and a piping bag. Pastry bags are expensive to buy frequently, so it is important to use them carefully. Parchment paper piping bags are easy to make but cannot be refilled and have to be discarded after one use. Use plastic sealable bags that are cheap to buy and can be filled and refilled without a lot of mess. Place frosting in a plastic bag with a spoon or spatula, twist the top, snip a corner and begin piping. An easy way to practice bringing texture and patterns on cakes is to use a patterned paper towel for smoothing icing. Smooth buttercream icing on cake and allow it to dry so it does not stick to your finger when touched. Gently place a patterned paper towel on the cake and rub it to transfer the pattern on to the icing. You can also use a serrated knife to give a combed effect on the sides of a cake. 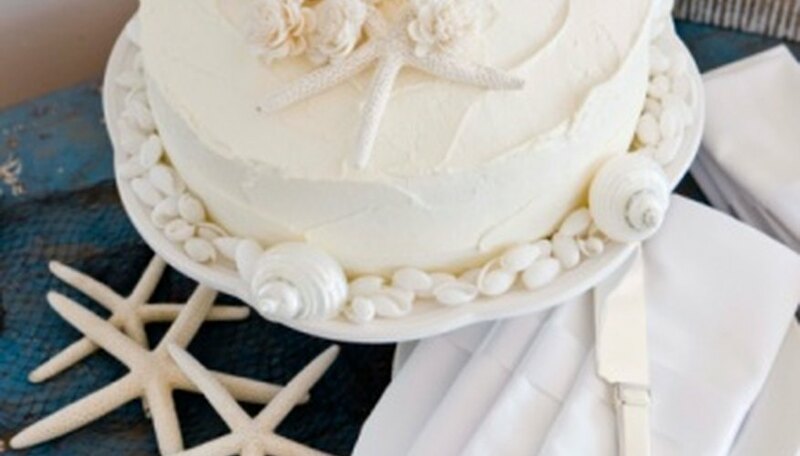 Instead of using a decorating comb tool, gently glide a serrated knife along the sides of a cake and wipe off the extra icing on the knife to use later. Buying different stencils for cake decoration can be expensive, specially if they are not used frequently. Doilies make excellent stencils for cake decoration. Frost the cake and allow it to rest for an hour so the icing sets properly. Gently place a doily on top of the cake and sprinkle powdered sugar on the doily using a fine mesh strainer. Carefully life the doily to reveal the stenciled pattern underneath. Use cocoa powder if the frosting is white or light-colored. You can also use colored sugar to create a stencil. Icing tips can be expensive to buy. Instead, cut pastry bags to pipe decorative shapes instead of inserting icing tips. Cut a triangle at the tip of the piping bag by snipping off the corners at a diagonal. This creates a leaf tip that can be used to pipe leaves and vines. Cut a corner of a piping bag at a slant angle to create an icing tip that can be used to pipe rose petals to create an intricate rose flower. By varying the length of the corner you snip off, you can create delicate or big piping patterns.